Outgoing Force Commander Major-General Luciano Portolano hands over the UN flag to Major-General Michael Beary. Outgoing Force Commander and HoM Major-General Portolano reviews the UNIFIL ceremonial guard before relinquishing command. Deputy Prime Minister and Minister of Defense Samir Mokbel laying a wreath at the UNIFIL cenotaph in memory of fallen peacekeepers. Outgoing Force Commander Major-General Luciano Portolano and incoming FC Major-General Michael Beary saluting at the hand-over ceremony. Incoming Force Commander Major-General Michael Beary addresses the ceremony after assuming command. Peacekeepers rising the flags of the UN, Lebanon and the 40 UNIFIL troop contributing countries at the ceremony of Transfer of Authority. The United Nations Interim Force in Lebanon (UNIFIL) today underwent a transfer of command from Major-General Luciano Portolano (Italy) to Major-General Michael Beary (Ireland). The hand-over ceremony at UNIFIL Headquarters in Naqoura was attended among others by the Lebanese Deputy Prime Minister and Defence Minister Mr. Samir Mokbel representing the Prime Minister, Member of Parliament Mr. Ali Bazzi representing the Parliament Speaker, Lebanese Armed Forces Commander General Jean Kahwaji, the Irish Minister of State at Department of Defence Paul Kehoe T.D., the Italian State Under-Secretary to the Ministry of Defence Gioacchino Alfano, UN Resident Coordinator Philippe Lazzarini, Vice Admiral Mark Mellet, Irish Chief of Staff, Members of Lebanese Parliament, senior officers of the Lebanese Armed Forces, Internal Security Forces, General Security and State Security, religious leaders, regional and local government officials, ambassadors and senior UN officials. Major-General Portolano reviewed a UNIFIL Honour Guard and laid a wreath in memory of peacekeepers who lost their lives in the service of peace since 1978. He later signed the Transfer of Authority document and handed over the UN Flag to Major-General Beary. The Italian Under-Secretary to the ministry of Defence Alfano, the Irish Minister of State at Department of Defence Paul Kehoe T.D. and United Nations Resident Coordinator for Lebanon Lazzarini also addressed the ceremony. Major-General Beary has extensive experience including three deployments in southern Lebanon with UNIFIL and a long and distinguished career since joining the Irish Army as an Infantry Corps Officer in 1975. He served in a wide variety of assignments and held several command and staff officer appointments, including at the unit, brigade and defence force headquarters levels. Today’s ceremony included a cultural performance by UNIFIL peacekeepers from different nationalities. 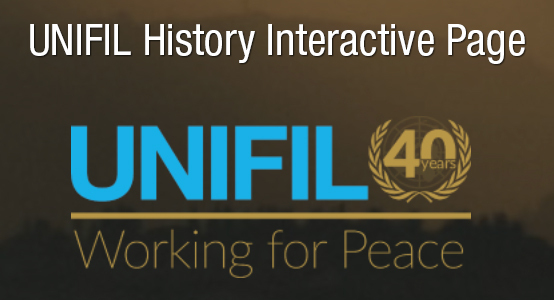 Currently, UNIFIL comprises almost 10,500 military personnel from 40 countries, including the Maritime Task Force, the only naval force in peacekeeping operations - and some 1,000 civilian national and international staff.